Wedding PR: Travel Channel, The Knot, and more! Hooray for Friday! We are so thrilled to share client features on Travel Channel, The Knot, and so much more! Keep scrolling to see all the latest. 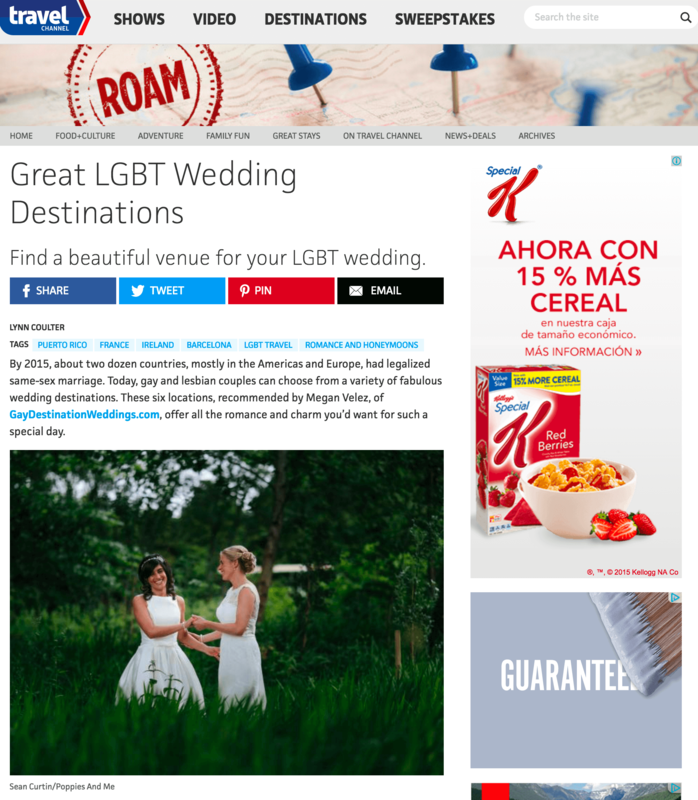 Destination Weddings and George Vivanco Photography were featured on Travel Channel in the article, Great LGBT Wedding Destinations. See the full article here. Be Photography was featured in the Women’s Health roundup, 8 Photographers Share Their #1 Tricks to Looking Your Best in Wedding Pics. See the full feature here. OFD Consulting was featured on Honeybook with the guest blog, How to Embrace your Niche. See the full feature here. Taylor’d Events, Historic Mankin Mansion, Stephanie Yonce Photography, Be Photography, Turner Photography, and Fantasy Sound Event Services were featured in Huffington Post, speaking on Summer Weddings: How to Keep Your Guests Cool. See the full feature here. Stephanie Yonce Photography was featured in The Knot article, How to Handle Unruly Wedding Guests. See the full feature here. OFD Consulting, 100 Candles, Fantasy Sound Event Services, and Taylor’d Events were featured on My Business Genius in the article, 14 Sure-Fire Ways to Stand Out From Your Competition. See the full article here. Destination Weddings was featured on Travel Pulse in the article, What Destinations are Hot in July? See the full feature here. Historic Mankin Mansion was featured on Plan the Day with their guest article, Tips for Finding Your Perfect Venue. See the full article here. Destination Weddings was featured in The Knot article, 4 Must-See European Castles to Host Your Wedding. See the full feature here. OFD Consulting was featured on Blissful Creatives with the guest article, The Key to Developing and Nurturing Media Relationships – With Meghan Ely. See the full article here.